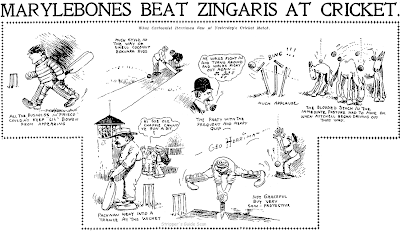 Herriman proves he's game to do cartoons about just about any sport under the sun when he comments on a cricket match (May 31 1907) and a handball tourney (June 2 1907). 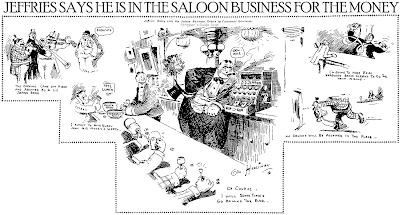 Sunday, June 9 1907 --Herriman got a well-deserved one week vacation before this cartoon bringing the news that boxing champ Jim Jeffries was to open a saloon in Los Angeles. I think this is one of Herriman's best 'light' cartoons so far at the Examiner. Nicely balanced with good side vignettes framing a wonderful detailed caricature of Jeffries in the middle. Fine stuff! 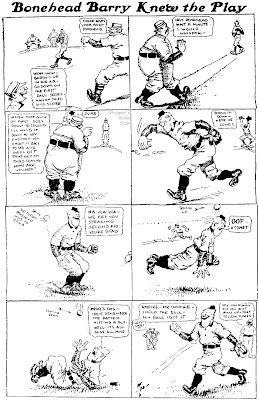 Ed Wheelan became a featured player on the New York American's comics page in late 1915, penning a wide variety of comic strips through mid-1916 when he was temporarily pulled off that duty to supply sports cartoons. Here's one of his features (or actually two counting the 'daily topper' that was currently in vogue with Hearst). Always Take Papa's Advice had a rather frail little running gag, with papa giving the doting son some good advice and then proceeding to break it himself. Ho hum. The 'topper' started out with the long-winded moniker Johnny Hope and Old Man Experience, then as When Hope and Experience Meet, and was later slimmed down to Hope and Experience. Later still it became the 'featured' Wheelan daily as Old Man Experience. Microfilm for the New York American is in one heck of a mess throughout the second half of the 1910s so the best running dates I can offer for Always Take Papa's Advice are from the Pittsburgh Post which ran the American's line-up pretty faithfully, but in fits and starts and generally a little bit late. The running dates there are March 21 to June 18 1916. Hope and Experience first appeared on December 10 1915 and ran sporadically as a 'topper' through 1916. 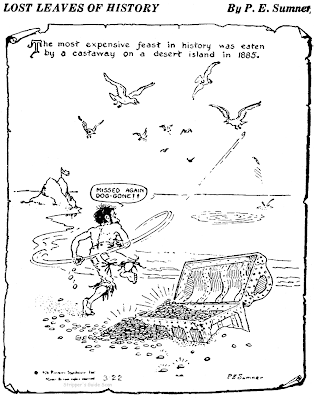 In 1917 the strip graduated to featured status and ran until April 6 1918. Running dates for this feature from the New York American itself. Thanks for the kind words. How I'm helping to revive print cartooning by showing cartoons on the web I dunno, but I'm all for it if I am! I wonder how many of our blog readers understand that the low-res versions of the cartoons I post here are mere shadows of their quality on the printed page. Granted plenty of the obscurities I show here are not the greatest examples of graphic artistry, but others I'm downright ashamed to show here because it does not serve the creators fairly. A recent example would be the Fred Richardson drawings from early December. Those really ought to be seen on paper to appreciate the masterful linework. Your head is probably pounding this morning from too much New Year's Eve merriment, so we'll keep it very light today. ".. but the accompanying Swiss chard was tiresomely vegetal." Figure the steak was ludicrously meaty? And the wine, I bet that was tediously liquid. No, no, not pretentious at all. 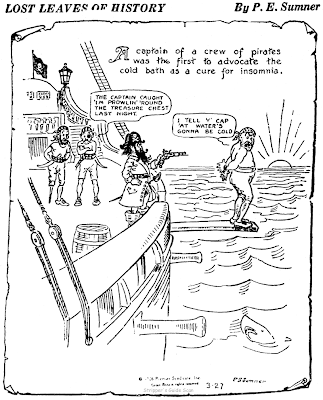 A correspondent writes asking if the first strip of The Katzenjammer Kids (December 12 1897) has been reprinted. I could have sworn I'd seen it somewhere but I came up empty when I checked the most likely suspects in my library. Anyone recall where it was reprinted? As I promised way back at the beginning of 2008, I have in fact created a book proposal for the Stripper's Guide indexing project. It is now making the rounds of likely publishers. I've gotten one definite "no" so far and I'm waiting to hear from the next in line. If you are a book publisher who would like to review the proposal, or know of a publisher likely to be interested in publishing the definitive guide to U.S. newspaper comic strip and cartoon panels, please let me know. You may have noticed that along the sidebar on the left I've added a link to Amazon.com with a list of the books I've reviewed here on the Stripper's Guide blog. If you click through from here to purchase these books I get a token referral payment from Amazon and you pay nothing extra for the books. Do the blog a favor and use the click-through! I doubt many of you bother to go back and re-read old Stripper's Guide blog posts to see what sort of comments have accrued, but there have been some interesting discussions that didn't get rolling sometimes until weeks, months or years had passed. One of the oddest has been on my post about a certain 1980s toy adapted to comic strips. Check out the comments at the end of this post. Happy New Year, Allan!---Wasn't the first KATZENJAMMER KIDS reproduced in "Stripscene" back in the 70's?----------As far as the "HE-MAN" business goes, there can never be anything so awful that there isn't someone out there that really digs it. There comes to mind a guy that was obsessed with those we-need-100-by Thursday 1960 TV Popeye cartoons.----Cole. I very much appreciate what you're doing; it's SO necessary. I also collct comic books, but I would gladly give up my collection of 30,000 to complete my run of Gordo. I received for XMas a copy of The Comics The Complete Story by Brian Walker, originally published as two volumes in 2002 and 2004. Your opinion? Cole -- good memory! I found it in issue #22. Hope that fella who was looking for it is still tuned in. Brett -- I generally liked Walker's books, though there were regrettable errors (this is becoming quite a tradition in strip histories). I felt that the Before 1945 book was the superior book of the two. The After '45 book relies much too heavily on material cribbed from E&P as opposed to what I was hoping for -- since Walker is an industry insider I wished he had taken greater advantage of his position to talk directly to the living creators and get their real stories, not the marketing flack baloney that gets written for E&P. Maybe something will pop out at you there. The description you give doesn't ring any bells for me. An unusual success story, Roger Bean was one of the earliest family strips. 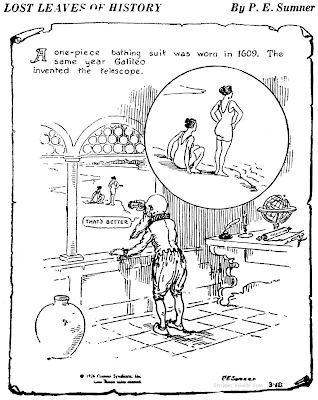 Charles 'Chic' Jackson created the comic strip for the Indianapolis Star where it first appeared on April 22 1913. Unlike most comic strips of the day which depended on gimmickry of one sort or another, the Bean family were 'jest plain folks' and Jackson poked fun at their foibles and frailties with no mercy. He also introduced continuities, a rarity at that time. Hoosiers like their homegrown cartoonists and quickly became devoted to the strip. Roger Bean became a must-read in Indianapolis, and Jackson began syndicating the strip in the Midwest through the Laura Leonard Newspaper Service. Just two years into the run Jackson further consolidated his franchise by adding reprint books to his repertoire. Legend has it that a brand of coffee was also named after the strip, but I've been keeping my eye peeled for proof of that for years and have never found any evidence. Roger Bean's franchise took a serious hit in the 20s when other family strips became popular. The Nebbs, Doing of the Duffs and others all now plowed the same ground. The Gumps, particularly, seems to have been directly modeled on Roger Bean. Jackson's creation couldn't keep up with these more professionally produced strips. 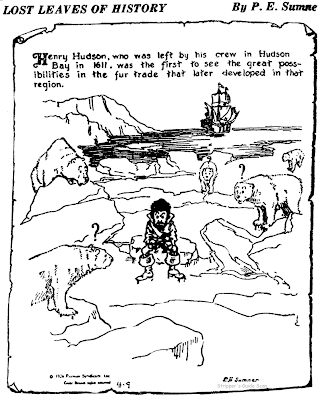 Jackson was, to be kind, a folk cartoonist. His drawings, full of tortured anatomy, inexpressive faces and blank backgrounds, were decidedly unpleasant to view, and amazingly, never improved one iota throughout the long run of the strip. 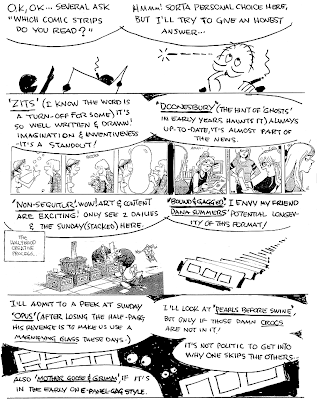 His fascination with dialect made many of his strips an arduous exercise in deciphering the characters' speech. Jackson tried to improve his fortunes in 1925 when he signed on with the George Matthew Adams Service newspaper syndicate. The national syndication did help, miraculously getting his strip into some big city papers including the Chicago Daily News. But Roger Bean remained a limited success, still mostly appearing in Indiana and other Midwest papers. Roger Bean ended after a twenty year run on September 23 1933, and Chic Jackson passed away the next year. 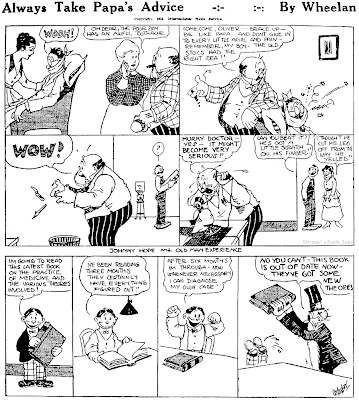 A couple of addendums on Roger Bean; first, it has been said on Lambiek.net that the family members aged in this strip, an innovation usually attributed to Frank King's Gasoline Alley. Although I can't claim to have read a huge number of Roger Bean strips I haven't seen any indication that the characters aged. Perhaps the children grew up some over the years. Suffice to say I'm skeptical of the claim. Second, regarding the racist stereotyping of the black character Jose as an utterly brainless idiot -- in my (admittedly limited) reading of the strip I've come to the conclusion that Jackson may well have cleverly been subverting the stereotype and that Jose is anything but dumb. I think she's actually brilliantly clever -- she plays the part of a fool to drive the Beans crazy and to ensure that she's never depended on or given any responsibilities. Am I giving Jackson too much credit? Roger Bean was syndicated until Jackson died. The strip lasted until June 1934 in the Manchester, N.H. LEADER. The day after he died a cartoon gravestone, a strip wide on the comic page marked his passing. It had been a fixture there for almost exactly twenty years. Thanks very much for the correction. My end date was based on when it ended in the Chicago Daily News. Might you have a scan of that strip available to share here on the blog? The info of Comiclopedia on Chic Jackson's strip comes from Jerry Robinson's book 'The Comics' (Berkley, 1974). It says on page 101: "The family strip had its own population explosion. Roger Bean by Chic Jackson, one of the first comic families to age, had started back in 1913." Great to have some more info on Chic Jackson on the web. Is it okay with you if we update our bio with the info you gave on your blog? It would also be great if we could use some (fragments) of the strips you posted as illustration. I shall make a link to your excellent blog at the bottom of the page. Well, Jerry Robinson is a great guy but as a comics historian let's say he doesn't gets bogged down in the details. Maybe he's right about the aging thing, I just haven't noticed it in my limited reading of the strip. That being said, his Percy Crosby book is one of my favorite cartoonist bios. I make no claims to the scans on the blog since I am not the copyright holder. I do appreciate it if those who re-use them give a credit line to my blog though as a courtesy. As for the editorial content, that is copyrighted. The facts, of course, are public domain but the text of my essays may not be reproduced. Thanks. I won't use the entire text, I'd just like to update the entry with with some extra facts. Of course I'll add a link! I am cataloguing a Chic Jackson, Roger Bean oblong book here at Babbitt's Books today! I agree with what you wrote about Jose. Although drawn as a racial stereotype, she is an intelligent and well-rounded character. That was Jackson's real strength, not just with Jose but with all of his characters. As an artist, he was never very accomplished, but as a writer, he was a keen observer and had a good ear for Midwestern speech. Jackson's characters did age. His foundling son Woodrow (named for the president) arrived on his doorstep as a baby. By the time the strip ended, he was, I believe, approaching college age. The foundling child who ages in real time was his innovation, not Frank King's. Because of the obscurity of Roger Bean, however, and the fame of Gasoline Alley, King gets the credit. Interesting that he used the 'baby on the doorstep' plot. I didn't know about that. Do you know what date that happened? If it was before Gas Alley did the same, I'd sure like to find those strips to see just how close the parallel is! I have a soft-bound book that is a collection of his strips, the front cover title is "Roger Bean" with a small profile of the character...I'm not sure when it was published but I believe it was after his death because there is a dedication to Chic and a photo of him working on a strip on the inside: "Happiness is one thing; sorrow, joy, fun and trouble are others - but living is all of them. To the memory of him who depicted everyday life and the human side of humanity - and to the people whose loyal support he so appreciated is this volume of his work dedicated." Woodrow Wilson Bean was born on November 13, 1914, and showed up on Roger and Sylvia Bean's doorstep in a market basket on Christmas Day, 1914. 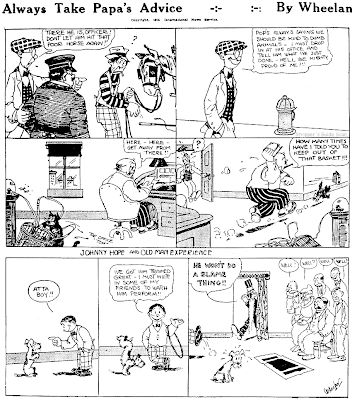 He was already four years old by the time Gasoline Alley made its debut on November 24, 1918. Frank King followed Chic Jackson's example by having Skeezix delivered to Walt Wallet's doorstep, also on a holiday, Valentine's Day, 1921. I imagine King knew of Jackson's innovation as there was a close connection between Chicago and Hoosier cartoonists in those days. I'm not sure that anyone knows about the innovation now, though. For many years I had an old hand drawing, that was done by Chic Jackson. I found it in the trash. I don't remember the date, but it was way back there. It was in a frame, and had some cartoon characters on it. Looked liked he gave it to some nursing home, the way he wrote to whom it went to. It was signed by him. I asked a few people in Kansas about it, and no one ever heard of him. But this was maybe 30 yrs ago. So in the early 80's I went to Ca. on vacation, and I took it, and sold it to a local shop, which deals in antiques. Wish I had it now, to see what it would be worth. I have an Indianapolis Star dated Dec. 7 1918 that has a Roger Bean comic and directly below it is an advertisement for Roger Bean Coffee. I would post a picture for you but do not know how to do it. I run an antique mall in south Texas and recently one of the vendors brought in The Roger Bean Coffee Book which is a compilation of Roger Bean comic strips. It was published by Schnull & Co., Packers Roger Bean Coffee, Indianapolis, Ind. The copyright is 1916 Roger Bean Association. Research into Schnull & Co. showed it was a wholesale grocer in Indianapolis who packaged their own line of Roger Bean coffee. 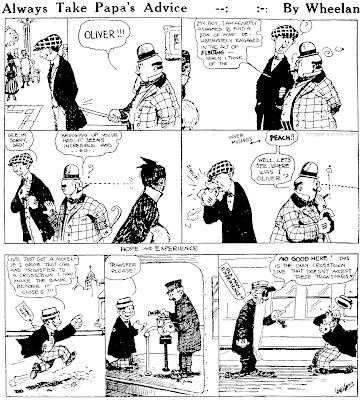 Just to clarify: Chic Jackson was born on Jan 1, 1876 and died June 3, 1934, minutes after finishing a week of strips. The last daily ran on June 23, 1934. I do have a scan of the tribute drawing done which was published June 5, 1934. Finally, so far as I know, there were four volumes of collected "Roger Bean Strips" -- published in 1915, 1916, 1nd 1917. PS -- I noticed that his Grand-Daughter inherited his drawing table -- the tribute drawing includes a photograph of his table. I have a original 1915 Roger Bean book in very good shape. Anyone know anything about the value? Here's a cute idea that never caught on -- Lost Leaves of History offered a satirical view of famous events of the past. The feature was attractively drawn by a fellow named P.E. Sumner whose bio, other than this short-lived feature, is a mystery to me. The feature was distributed by Hearst's Premier Syndicate. Premier seemed to always get stuck with the lower end material; pretty much the only feature they had of any popularity was Dumb Dora, and it got bounced over to a higher-profile Hearst syndicate as soon as it showed signs of catching on. Lost Leaves of History ran from March 1 to October 2 1926 in a very short list of papers. Thanks to Jeffrey Lindenblatt for the running dates from the Long Island Star, and Cole Johnson for these samples from the microfilm of the Philadelphia Sun. 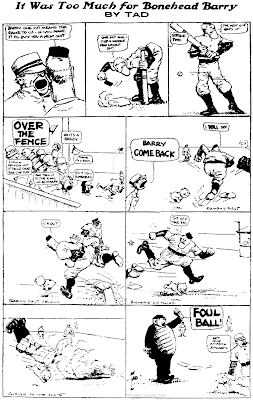 One of the very first strips about a baseball player, Bonehead Barry was an occasional feature by Thomas "TAD" Dorgan that he penned in lieu of his daily sports editorial and other topical humor cartoons. Filled with his trademark street lingo and an intimate knowledge of baseball strategy, the strip was a delight for fans of the game. The painfully dumb but physically talented Barry was the character template on which most later baseball strips would build, including You Know Me Al, Cotton Woods, Ozark Ike and Soapy Waters. The running dates on this strip (May 13 1909 - March 12 1910) are not at all firm because they are based on appearances in the LA Examiner, not TAD's home paper in New York, the Evening Journal. I didn't do the indexing of the New York Hearst papers from this era, the very able Dave Strickler already having completed that task. Strickler's index doesn't include Bonehead Barry so either it didn't appear there or Dave didn't recognize its occasional appearances as a series -- pretty reasonable since it would have appeared on the sports page, not with the Journal's other comics. Tad was one of those cartoonists who threw an awful lot of spaghetti on the wall to see what would stick and in such situations it's very tough to do a proper indexing job when working with limited time and a lot of material to get through. "was a delight for fans of the game.,." And is now to me.thank you for posting it, with no one from the time to read it, so that it can seen by new rewaders Dorgan was one of the certainly earlier cartoonist to really humanize dogs in his other strips..like Judge Rummy...Hot dog!! Excellent choices... although Zits surprised me. Not that it's not good, just that you enjoy it! LOL!